Race cars in action on the track with 8K camera stabilisation and smooth moving shots. 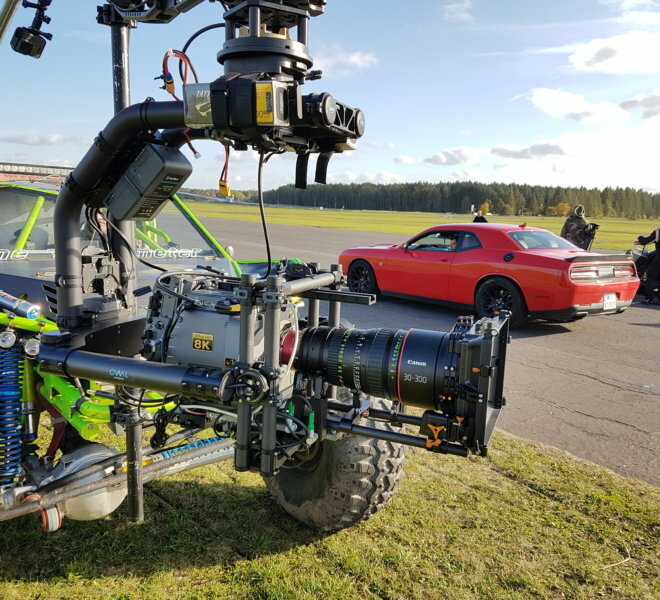 PSNC film crew in cooperation with two other companies did an 8K experimental shooting on Racetrack Poznan and at an old military airport in Bednary. 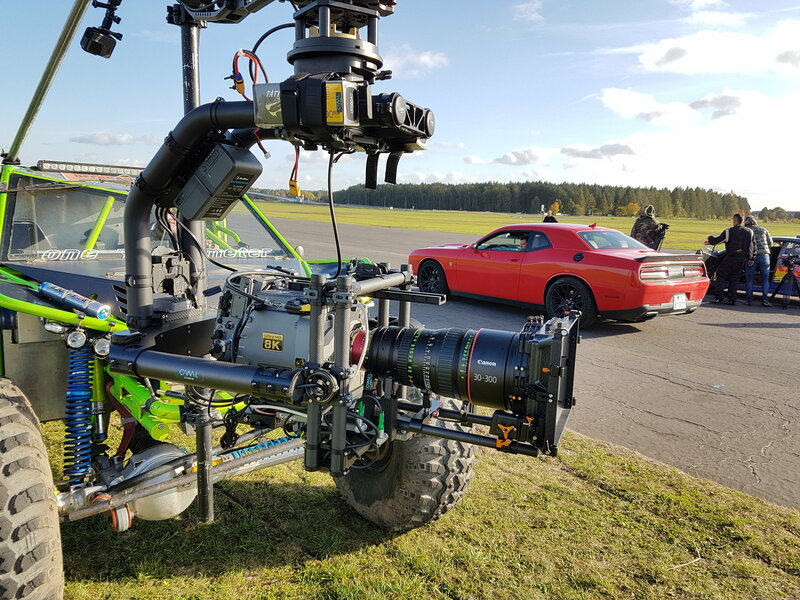 The choice was made on the racetrack, mainly because one of our Polish broadcasters was shooting “Automaniak”, a Polish version of well known TV show “Top Gear” and they brought a few nice cars which we could use for our experimental 8K shooting with big gimbal installed on the follow car. During two day shooting session mainly sports car were filmed, but also professional cyclists were caught “on tape” during their training. 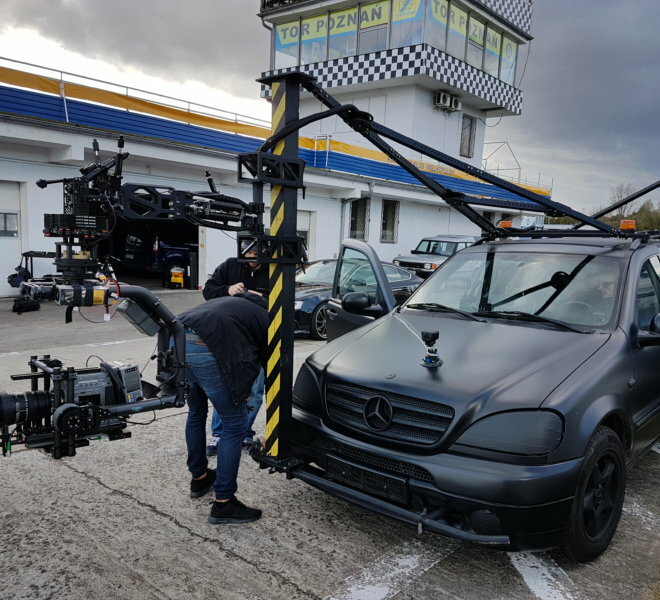 The preparations for this shooting started when one of the local rental company asked us if we are interested in cooperation in tests of the newly released gimbal – Movie XL. They bought this gimbal and wanted to test it in action with a really big and heavy camera system. The Sony F65 camera with Canon 30-300 lens fits perfectly for this purpose. First tests were made only with the gimbal and camera alone – hanging on truss construction in the studio. 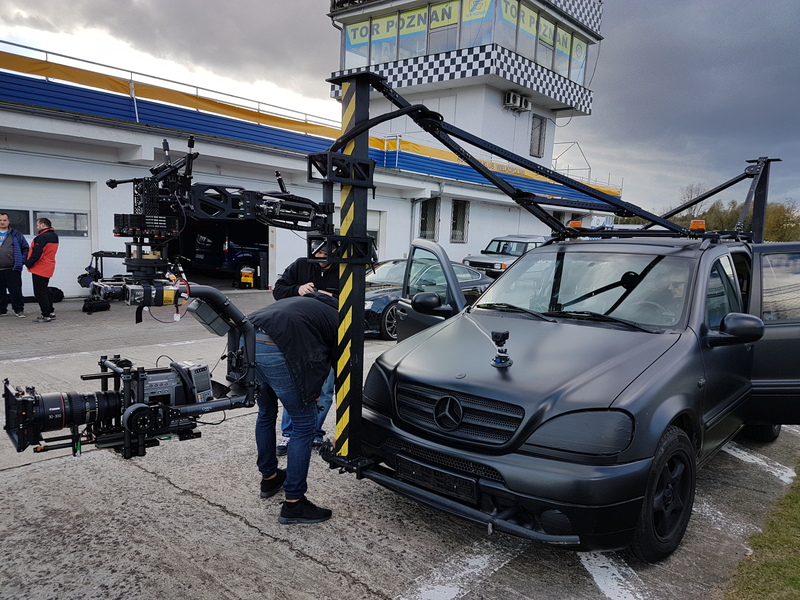 After successful testing next step was to find an appropriate place and event for shooting and the TV realization of “Automaniak” on Poznan Race Track was an ideal opportunity. Starting with preparation on the shooting day it turned out that the camera was even bigger than expected so we needed to detach the battery and place in elsewhere on the gimbal. The overall weight of the camera with gimbal was about 40-50 kg. The next day was even more intense because the camera car changed to an off-road vehicle. It was driving along a start lane on an airport on bare grass. The car was a custom made vehicle which upper construction was a roll-cage. The gimbal with camera needed to be mounted to that construction. There was also only space for two people, so one driver and camera operator. To make it more interesting this vehicle had no windscreens and drove over 100km/h in bare terrain. After two days of shooting all equipment survived without any loss or damage, did an excellent job and all objectives of the tests have been met. Many nice shots were gained and a lot of parameters were tested (mainly stabilisation of heavy camera system and remote control). The weather conditions were perfect and the quality of recordings from Sony F65 8K camera allows to produce not only SDR but also excellent looking HDR content.